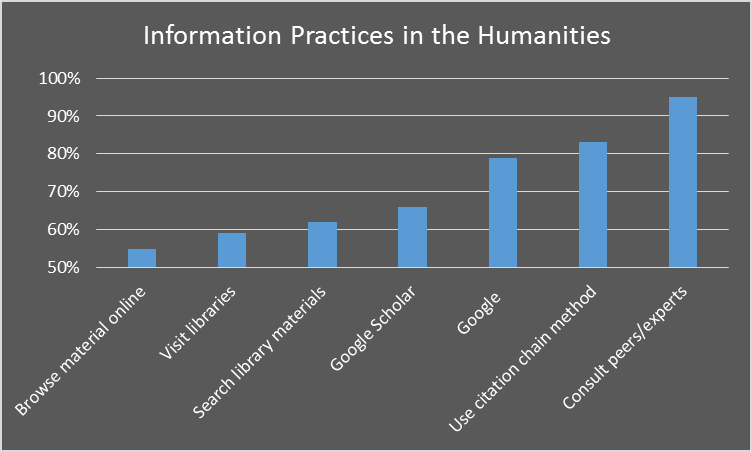 Part Two: What is Digital Humanities? As I mentioned in Part One of this blog thread, I attended The Oxford Internet Institute’s Summer Doctoral Programme and had the opportunity to hear from research fellow and Digital Humanities (DH) specialist Dr. Kathryn Eccles. Their findings seem to ease some fears that digitized materials will lead to lazier and less social scholars (see unnecessarily apocalyptic pieces such as Marche’s “Literature is not data: Against Digital Humanities”). Almost all of their sample still speak with other researchers and over half still visit libraries. Kathryn also noted that as DH scholars we need to ensure that we remain conceptual, reflexive, and philosophical. We can’t just rely on libraries and IT. There are already journals and conferences dedicated to DH topics, and we need to continue to build scholarly networks. Inevitably, some questions arose in our discussion including, “do you have to know how to use tools?” and “do you have to build things?” Researchers are especially concerned with areas such as access to software and additional time beyond their usual reading, writing, and so on. The argument made was that all DH scholars do not need to know how to code. “Think about all of the computer scientists who have never had liberal arts training!” many participants added. I, on the other hand, have to disagree with these claims. I believe that all DH scholars should have at least introductory coding and building knowledge. I don’t mean to imply that scholars need to actually code or build huge projects themselves, but a working knowledge is necessary. If you are blind to how tools and coding structures work, you are at a serious disadvantage. Additionally, not everyone has the resources to hire computer scientists to aid them in their DH research. Those who have to work on their own, or at least without programmers or computer scientists, will very quickly find that pre-made tools often can just not give them the data they desire. I have fallen into this problem myself; I basically taught myself introductory Ruby so that I could scrape Twitter data that would actually give me telling findings. I plan on learning “R” in the near future. An introductory understanding is pertinent for the future in general as well. If more of our lives begin to exist in digital spaces, I think it only makes sense to have a better understanding of digital spaces. David M. Berry (ed.) Understanding Digital Humanities, (Palgrave 2012), Introduction. Andrew Prescott, ‘Consumers, Creators or Commentators? Problems of Audience and Mission in the Digital Humanities’, in Arts and Humanities in Higher Education: An International Journal of Theory, Research and Practice (Sage, 2012).